In 1977 Ian Hunter reached rock bottom with the awful “Overnight Angels”. Seeing him ‘live’ in Oslo at the time was so depressing. His music had turned into a mediocre noise. Of course we all knew the real Ian Hunter would return. And now he has: inspired, on fire, high on nine brand new quality songs. He’s got blood brother Mick Ronson and members of Bruce Springsteen’s E Street Band backing him. Ellen Foley is doing some mighty hollering. Even John Cale lends a helping hand on one of the tracks. It just can’t go wrong. There’s slight glam traces of the Mott and Bowie of old in the fat and insistent soundscape, there’s the delightful keyboard floorboards and a rolling boogie beat. Sparks fly as Max Weinberg hits the skins and the guitars cut white gashes in the dark backdrop. And Ian is the captain, completely in control. His voice, hoarse and hungry, caresses the words and spits them out. When the band rocks, the music is a joyous and thundering celebration with a mean sneer. When it slows down, it kisses your soul. Ian moves effortlessly between the punchy stuff and his signature elongated melancholy ballads. The lonely beauty of “Ships” is so overwhelmingly emotional it makes you wanna cry. “The Outsider”, with its cascading climaxes, is a stunning portrait of a man on the run. Then there’s the sizzling “Cleveland Rocks” and the delightful Mott-pastiche “Just Another Night”, Ian’s voice so in command that it grows legs and starts walking. Is this his best album yet? I’m willing to stick my neck out. 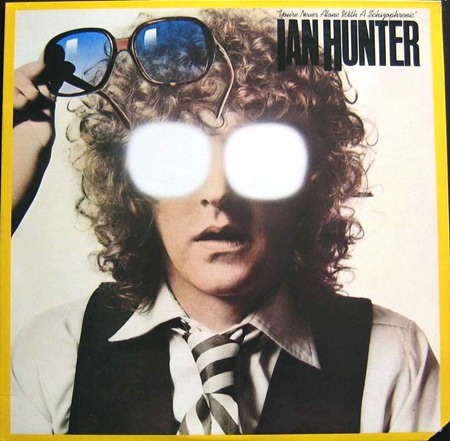 Note: Later that year (November 22) I had the pleasure of seeing Ian Hunter at The Hammersmith Odeon in London. What a triumphant return! The audience went completely bananas, and towards the end of the concert Ian was so moved he gave one of his golden Gibsons away to a fan. The boy couldn’t believe his luck and headed for exit, but was overtaken by the minders who grabbed the guitar and put it back on stage. This aggravated Ian who handed it over to the guy yet again, only for the same thing to happen. That really pissed Hunter off. He told the minders to leave the boy alone, and this time they made it out, both the boy and the guitar. It was one of those nights. He’s turning 76 in June, and he’s still out there playing, baring his soul to us. Simply amazing! Thank you Ian! – Carl Meyer, May 2015. *The deluxe CD-version released in 2009 contains 5 outtakes from the sessions plus a full 14 track live CD including 5 tracks from The Hammersmith Odeon.